I think of spring as a time of renewal. A time to readjust my life, to regroup and reprioritize. A good time to spring clean your life. 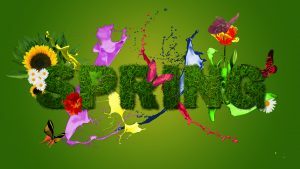 Here are some spring renewal rituals to get you started, but feel free to pick others that are right for you. • Purge physical clutter. Get rid of items you no longer love or use. I use the 40 Days of Lent to inspire me to purge at least that many items. • Let go of mental clutter. Clean up your to do list and remove incompletes. • Remove emotional clutter. Let the past go, forgive. • Challenge limiting beliefs. About you or others. • Replace negative thoughts with positive ones. Practice gratitude daily. • Start a new habit. Instead of giving one up, begin a new positive one for your health. • Take a hike. Literally. Get out in nature. • Try something new. A new food, hobby or something else that you have always wanted to do. • Practice quiet time. Turn off your electronics and just be. Selecting one or some of these practices can help rejuvenate you. The change in seasons always inspires me and especially Spring. New thoughts, new opportunities and a freshness emerge after the dull and staleness of a winter too long (in my opinion). Besides the budding flowers and trees, Spring can inspire a renewal in ourselves as well. So now that Spring has sprung this March, what are you inspired to reach toward?